We had clients who used 1ShoppingCart.com and needed ways to integrate product links into their Wordpress websites. We created a plugin to make the process easier. Here are articles that help use our plugin within your site and other articles about how best to use 1ShoppingCart.com for your eCommerce and/or marketing. Many people use the popular 1ShoppingCart eCommerce and marketing software to sell digital products and/or physical products but adding those products into your WordPress website can be very tedious and error-prone. Great News! You can now easily import your *simple* products hosted on 1ShoppingCart into WordPress. This method is free and does not require a developer. 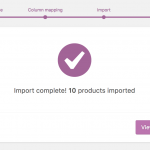 A new built-in CSV importer was included in WooCommerce as of version 3.1.0 that was released on 2017-06-28. 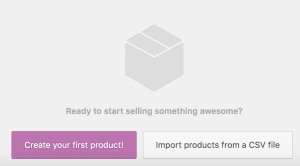 This is terrific news because you no longer need to purchase and install a premium Importer plugin to display your *simple* products in your WordPress site. 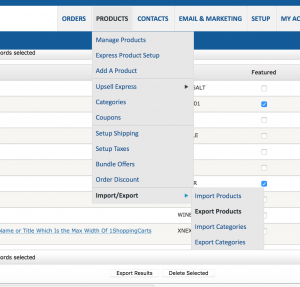 If your products are complex, with many product options, this method will NOT work for you because the built-in importer does not allow you to import all the product options that you are able to configure using 1ShoppingCart.com. 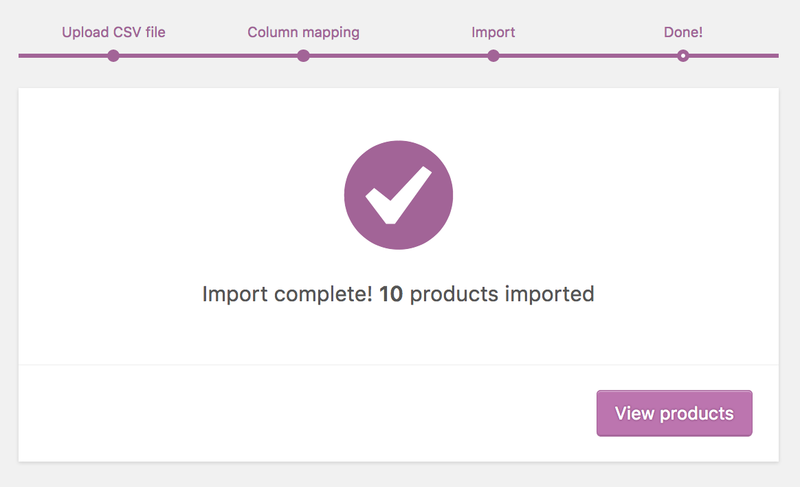 The WooCommerce’s built-in importer can be used to create all your products. Then you can use the importer again, at a later date, to update your products to reflect price and/or description changes. BUT, in order to update your products in WooCommerce, you need a way to uniquely identify the product. You can do this with a unique product name or SKU. Follow these simple steps to export your products from 1ShoppingCart, prepare the exported file for WooCommerce import and then import the file into WooCommerce. If you need help installing and configuring WooCommerce on your WordPress site, you can follow the instructions published by WooCommerce at https://docs.woocommerce.com/document/installing-uninstalling-woocommerce/. Export your products from 1ShoppingCart. 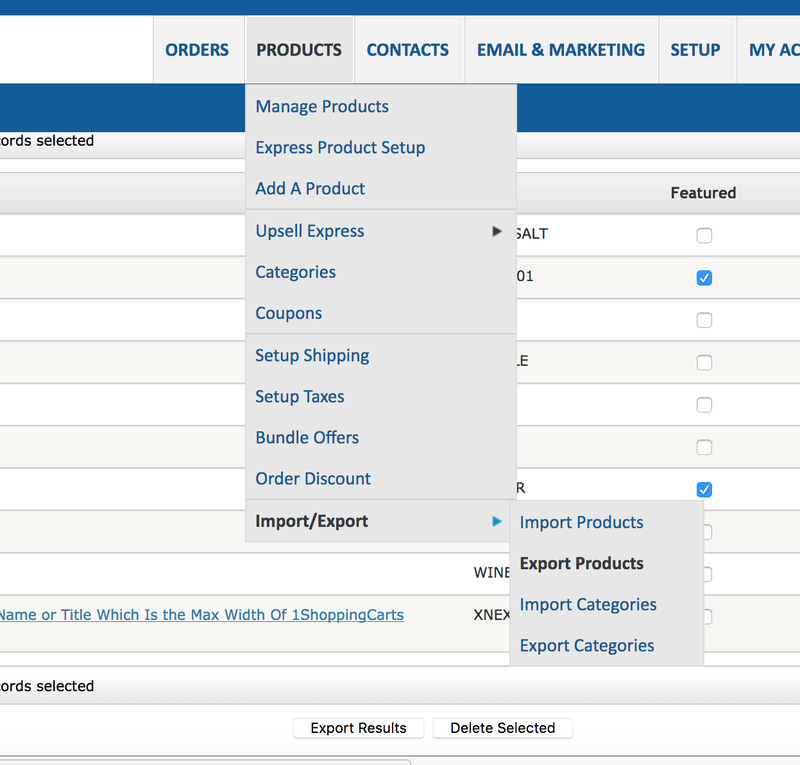 Navigate to the Products menu item, select Import/Export and then select Export Products. 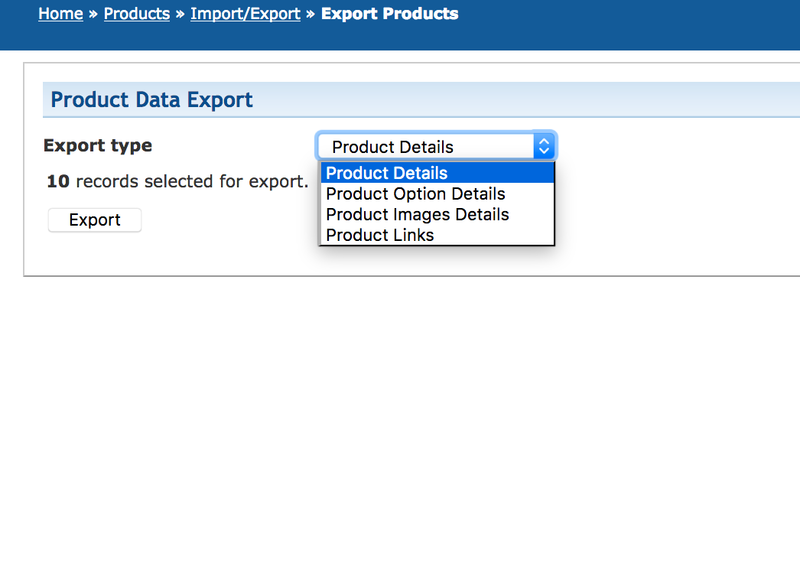 Select Product Details from the dropdown list box and click/tap the Export button. An export file will be created and downloaded to your computer in CSV format. 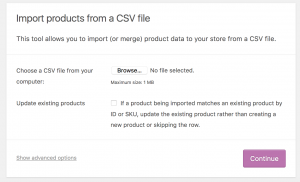 Prepare your CSV file to import into WooCommerce. The export created by 1ShoppingCart.com is not completely ready for import into WooCommerce. A few columns need to be added to the original CSV to ensure its easy import into WooCommerce. I used Google Sheets to manipulate the file. The formulas you find below are Google Sheets formulas but will also work with Excel. CAUTION: WooCommerce requires a UTF-8 formatted file. Excel for Mac will not produce a valid UTF-8 file and your import will fail. Please use Google Sheets instead. Your export from 1ShoppingCart.com contains 34 columns. You will be adding 5 more columns to the file. Images: Take a look at your export. Notice that the 26th column contains the name of the product image but not the full path to the image file. You will need the full image path to import the file correctly into WooCommerce. The full path of the image includes your 1ShoppingCart.com Merchant Id. If you do not know your 1ShoppingCart.com Merchant Id, the image to the left shows you where to find it in your Admin panel. Add a new column and label it Images. Insert this formula to the newly created column. The formula will preface the filename found in column Z with the “https://www.mcssl.com/content/” + your Merchant Id + “/”. Which will produce https://www.mcssl.com/content/000000000/my_image_file.jpg. Copy the formula down the column for each product row in the spreadsheet. Button Text: Add a new column and label it Button Text. You will fill this column with the words or phrase that you want to see on your WooCommerce buttons. This can be “Add to Cart,” “Buy Now,” etc. Type: Add a new column and label it Type. 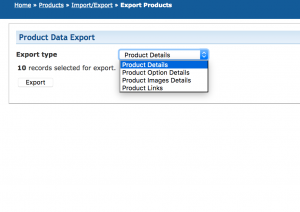 You will enter the word “external” into this column for each of the products that you are importing. Because you will be selling your products via 1ShoppingCart, you will need to let WooCommerce know that WooCommerce is only listing and describing the product, and the item will be sold elsewhere. Marking the product external ensures that the customer is taken to 1ShoppingCart.com to complete the transaction. Copy the formula down the column for each product you want to import. Categories: If you look at the 27th column of your spreadsheet, you will see the field called “path.” This field contains the product category(ies). If the product falls into multiple categories, you will see that the data in this column appears in this format – [Grocery,Beverage]. Notice that the multiple categories are surrounded by square brackets ( [ ] ). If you were to import this column as is into WooCommerce, it would create category names with those square brackets in them. The formula in this new column will remove those square brackets if they are present in the data. Enter the following formula in the new column. Download the Google Sheets file to your device as a CSV file. This is important. You must download the Google Sheets file in CSV format. Navigate to Products | All Products in your WordPress Admin panel. 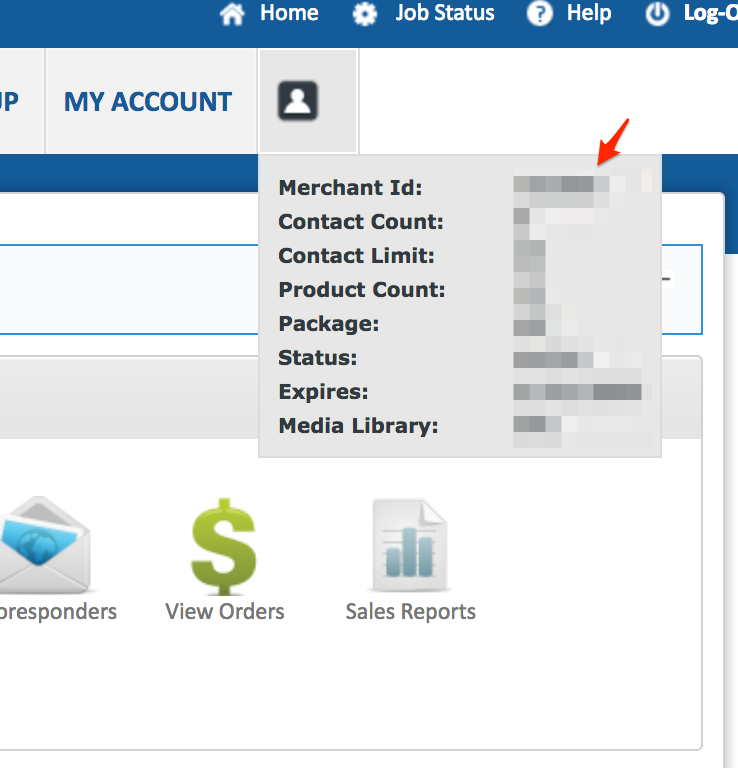 If there are no products in WooCommerce, you will see two buttons at the bottom of the page. 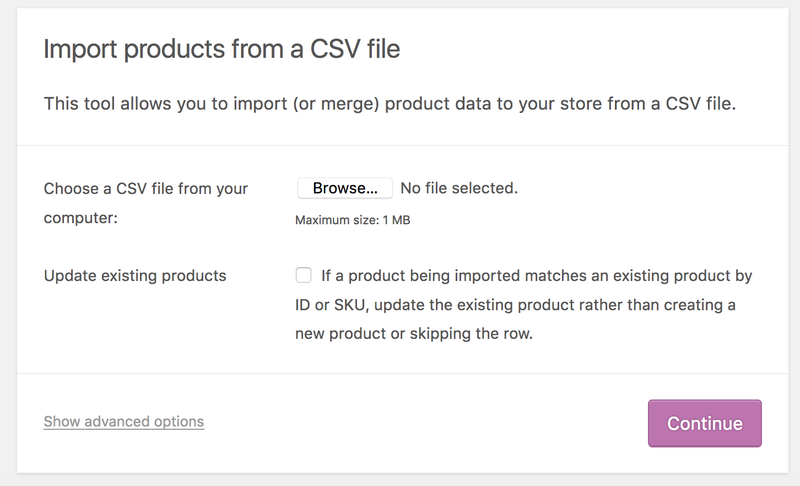 Click/Tap on the “Import products from a CSV file” button. If you already have a product in WooCommerce, look at the top of the page and click/tap the “Import” button. Here you will map the fields in your 1ShoppingCart.com export to WooCommerce fields. I have listed the column mapping below but if you would like to see the page as rendered in WooCommerce, click/tap here. If the importer finds problems with the file, you will see a link on the results page to the log file that will detail the issues with the file. Correct those errors and re-import the file. While the internet makes opening an online store easier than a bricks and mortar store, customers are not able to see, feel and hold virtual products the way they do items in a store on Main Street. Therefore, returns will be inevitable because for one reason or another one of your customers expected something different than what was explained in the description or provided in the product photos. Make returns easy for your customer and your staff by documenting, very simply, under what conditions you will accept a return and what steps the customer must take to get their merchandise returned. First and foremost, your return policy must be easy to find. Don’t hide this important information in the footer. Provide a link to your return policy in each product detail page – displayed prominently near the call to action – “Add to Cart” or “Buy Now” button. Have you ever shopped at LL Bean? They will accept returns of any product they have ever sold you, no matter what condition or how old. If you’re not happy with your purchase from LL Bean, they will accept the return and either replace the item or refund your money. Their return policy is plain and simple. Of course, not every online store can provide that kind of policy but you can clearly list the steps (the fewer the better) the customer needs to take and conditions (also, the fewer the better) in which you will accept their product return. When Zappos introduced their website and business, they knew they faced stiff competition from major department stores. They knew that customers liked and needed to try on many shoe styles and sizes before they made a purchase. Therefore, they needed to provide free shipping and free returns. Without that policy they didn’t stand a chance at success. The folks at Sock Addict provide a simple return policy. If the product is in original packaging they will accept a return 180 days after purchase – during the first 60 days, you will get a 100% refund and during day 61 through day 180, you will get store credit. But not all online stores can afford free shipping on returns like Zappos and you might be one of those businesses like Sock Addict that will accept a return but the customer must pay the shipping costs. If you, like the majority of online businesses, require your customers pay for the return shipping, make sure that stipulation is plainly stated in your return policy page. Have you given the proper thought to calculate your shipping fees? Too many online businesses lose money every time they ship an order to a customer. This is because shipping fees are an afterthought. Please don’t make the same mistake. 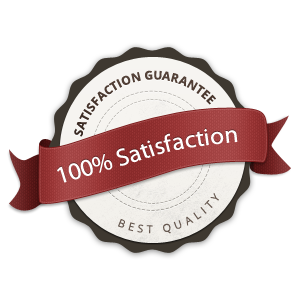 You have given careful consideration to the pricing of your products. Take the same time to carefully consider what is involved in the shipping of your products. Think about the time it takes to prepare the product for shipping, the packaging you will use to ship the product, the time to get the product to your shipping courier and of course, the actual cost your shipping courier charges you to ship your product. Can you offer free shipping or discounted shipping once the total purchase reaches a minimum amount? With your shipping costs calculated, does it make sense to increase the price of your products to absorb some or all of those costs and allow you to offer free shipping. Remember – free shipping may be the difference between a sale and an abandoned cart. The 1ShoppingCart.com API returns error codes that will help you troubleshoot the configuration of the WordPress Plugin for 1ShoppingCart.com. They are errors 2040, 4010, 4110, 4112 and 5000. These errors will appear in the WordPress Dashboard when you try to Build or Rebuild your product table. Or you may receive an email alerting you of the error when your WordPress installation tries to refresh your cache. 2040 No data found The plugin incrementally queries your 1ShoppingCart.com product catalog for changes. If there have not been any changes, 1ShoppingCart.com returns an error code 2040 No data returned. There is no need for action or alarm. I am always looking for new add to cart buttons for use with the 1ShoppingCart.com Plugin for WordPress. Today, I found a set on 365psd.com. Thank you Bharat Sharma. 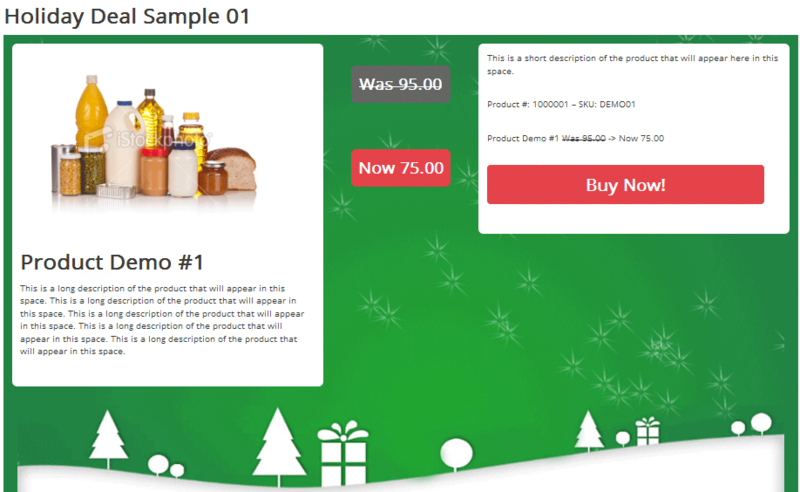 You have seen many sites offer 10 Days or 24 Days of Christmas offers using holiday graphics and colors. 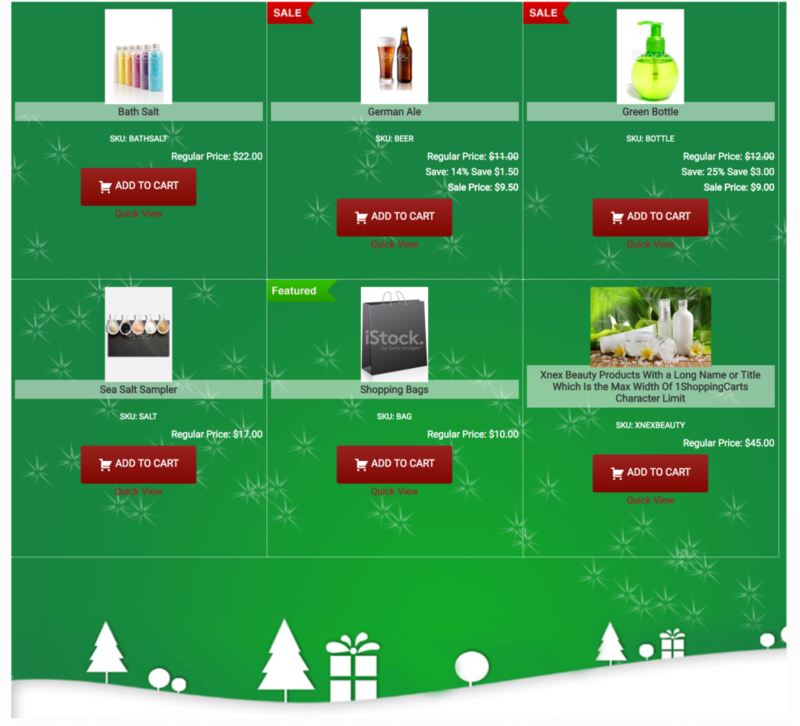 I thought I would create a product deal display using the 1ShoppingCart Plugin for WordPress. The snapshot below shows the format that I chose which mimics the Daily Deals that SitePoint.com is offering during the 2012 Holiday Season. Update 2017/08/03: This post has been updated for version 2.0 of the plugin. We are in the midst of the holidays and we thought we should spend some time creating a product display that could be easily used for the holidays. This example takes advantage of the display_format option within the shortcode so that the display on this particular page is uniquely different from the default. On the demonstration page, we have also included the CSS we used for this particular display should you want to copy and use it. Click here or the image below to see a demonstration of that holiday display. I thought I would show another example of a product price comparison table that can be created easily using the WordPress plugin for 1Shoppingcart.com. You will need to upgrade to version 1.5 of the premium 1ShoppingCart Plugin for WordPress to use this technique. Click here for a live demo of the price comparison table. Copy and paste the following HTML into your page or post along with the CSS from above to create the pricing chart shown at the top of this page.